Conventional wisdom says that when you get married, you will save lots of money but in some cases that is not true. in this time we are gonna be talking about the marriage tax penalty and how because of the way the tax code is structured. 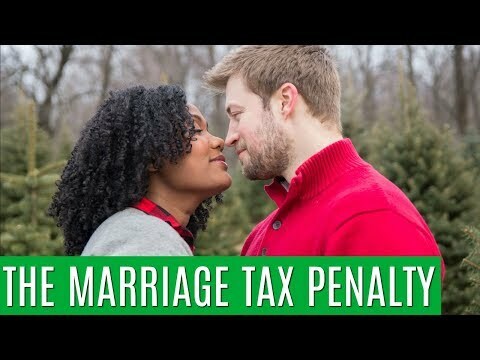 married people can actually end up paying more in taxes. at 15% lots of people think, that if you make more money that you’ll definitely pay more in taxes on everything because you’ll hit a higher tax bracket well it’s just on that additional dollar., so it’s bracket by bracket and don’t get confused that if you get into a higher tax bracket oh you’re gonna way more money .no it’s just on that additional dollar into that bracket this is a breakdown of the current tax and the different options for filing now. there is one more married filing separately but that’s exactly half the married rates we didn’t include that here. so what this chart shows you if you look across you’ll see let’s look at the 25% tax bracket you get into that tax bracket at 37,000 ,if you’re single 50,000 for a head of household and 75,000 for married. so practically that costs the married couple an extra nine hundred and twenty one dollars in taxes every single year not one year every single year so if they were married for I don’t know like 50 years that’d be almost like fifty thousand dollars which is just outrageous plus if you invest that money what yeah Lots that’s a hundred thousand easy yeah now let’s look at the head of household plus single and so just to clarify a head of household plus single would look like an unmarried couple who share a child and live together that’s head of household plus single you’ll notice right off the bat the single plus head of household brackets are higher than both the married or the single plus single at the fifteen percent tax bracket it starts at twenty two thousand six seventy five the twenty five percent bracket starts at eighty seven thousand nine hundred fifty the twenty eight percent bracket at two hundred twenty three thousand one hundred dollars thirty three percent bracket at four hundred thousand three dollars so if you were paying right at the top of the twenty eight percent bracket you would end up paying twenty one hundred less in taxes every year which means you will get twenty five hundred dollars of your money back I think that’s a really important distinction like people think you know don’t think of taxes as money that they have paid out of their income but that is exactly what they are what that is so when you lower your income tax liability you get to keep more of your money instead of passing it on okay and so it’s crazy that just not being married that is the only difference like not being legally married you would have twenty five hundred dollars more a year in your pocket every single year that you were married and this is just the beginning so this is just the beginning of the marriage penalty.